We were excited to play an active role in the Patriots at Pebble event last weekend in Pebble Beach, California, which raised more than $700,000 for the Marine Corps Scholarship Foundation. The weekend included a Marine Appreciation Day at the Naval Postgraduate School in Monterey on Saturday, as well as the Eagle, Globe & Anchor Awards Dinner on Sunday at the Inn at Spanish Bay. Golf tournaments were also held on Sunday at Spanish Bay and Monday at Pebble Beach Golf Links. Jarhead Wine Company was proud to donate both Jarhead Red and Jarhead Chardonnay to the awards dinner and auction. We were represented at Patriots at Pebble by David Macon, VP of sales and marketing at our affiliated Firestone Walker Brewing Company, along with Kevin Orona, the brewery’s national accounts manager. According to David, our wines were a hit at the auction. “The organizer told me that a wine named Jarhead Red is not a tough sell to old Marines,” he said. 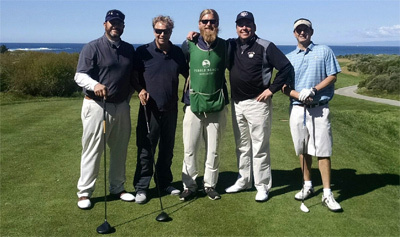 David and Kevin also hit the links along with team members Dean Biersch of Gordon Biersch Brewing Company and HopMonk Tavern, and Jeff Jordano, president of Pacific Beverage Company.